Round Arch Christmas Putz house no 7 with a snowy, glittered roof in a forest of bottlebrush trees. A little deer peeks around one of the trees. 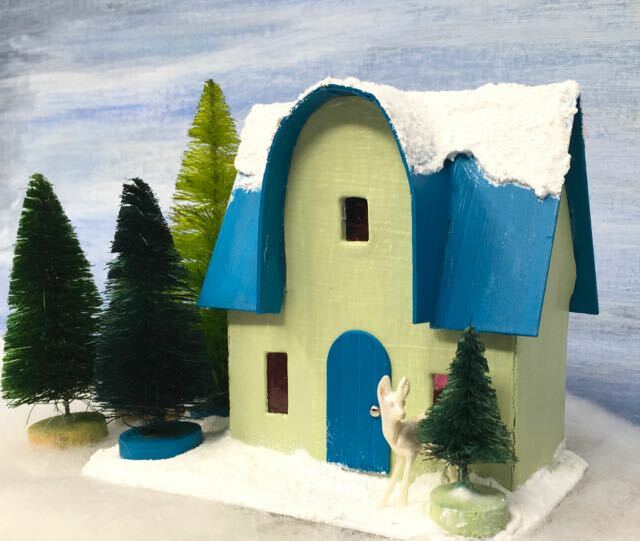 The newest addition to our Christmas village is this cute little Putz house with a rounded front arch. I like almost every little house that I make, but some of them appeal to me more than others. 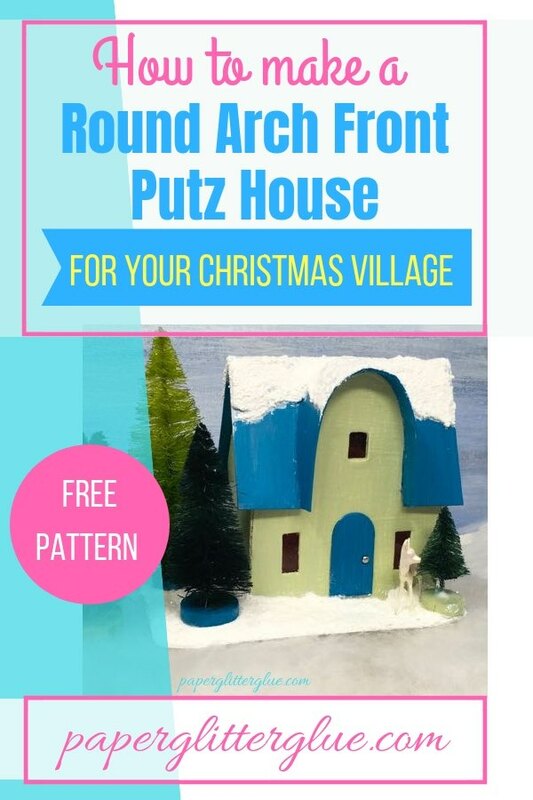 This one – the Round Arch Christmas Putz house (no. 7 in the 12 Houses for Christmas series) – I just love. 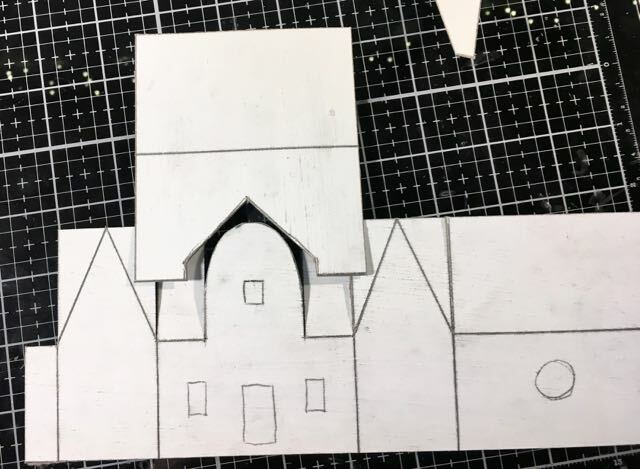 I’ve seen similar arches on vintage Putz houses, but I’ve never made on before. I wasn’t sure how easy it would be to glue the roof on a rounded arch. It turns out it wasn’t that hard. Below are the instructions and the link to the free printable pattern in the library. 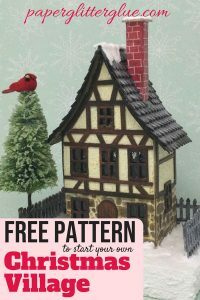 You can download the pattern from the Paper Glitter Glue library where I keep all my downloadable patterns, printables, and tutorials. 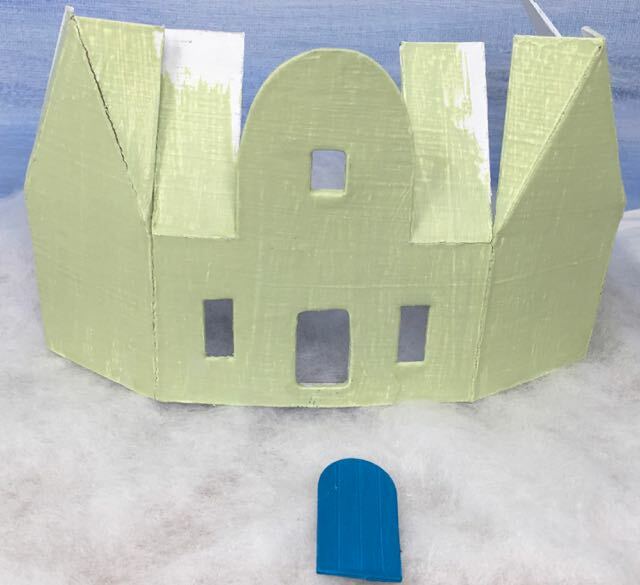 What do we need to construct the Round Arch Christmas Putz House? This pattern is available as a PDF in the Paper Glitter Glue library. Tape the pattern to your cardboard and trace around the pattern. My favorite method for transferring the pattern to cardboard is using tracing paper. 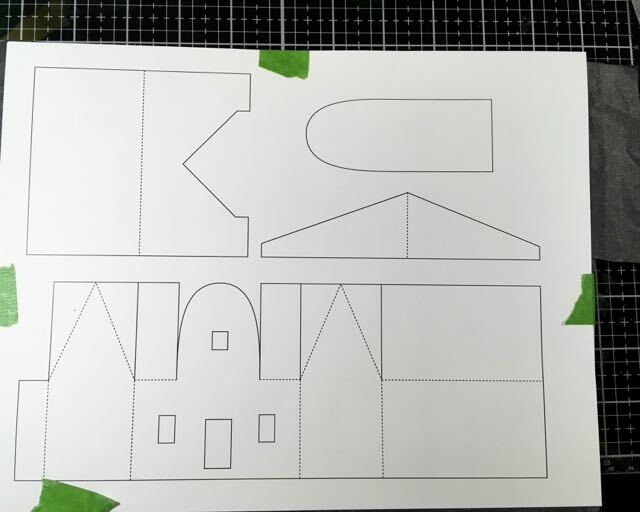 Below is the pattern cut out which is when I noticed that the roof pattern was just plain wrong. It is fixed now. Huh? Something is not right with the initial pattern. I fixed it on the PDF pattern in the library. Whoops! Roof doesn’t fit the little house. Good thing I did a test fit. If the roof fits, use it. Usually I score the fold lines with the back of my craft knife to make a sharp line for folding. Then I cut out the pattern. 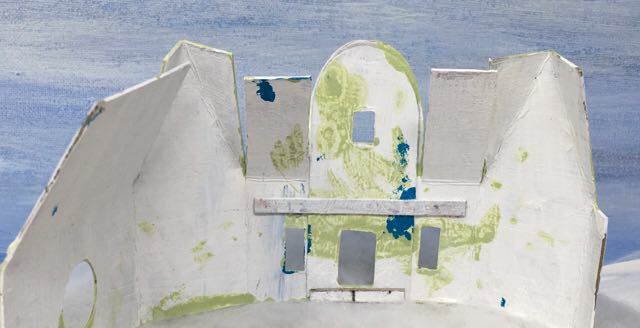 Often it is easier to cut out any little pieces first because then you have more cardboard to hold onto while cutting. Only 3 windows and one door for this pattern. You can use your own ideas about placement of windows and the door. In order to keep these patterns simple, I haven’t been adding many windows to the pattern. But you are free to add as many as you want. If you cut out a door, be sure to leave at the very least 1/8 inch intact at the bottom so your house is structurally more stable. I use this method for cutting out the doors and windows. 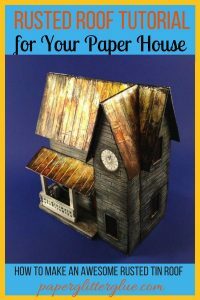 To make a cardboard base for your house, glue two sheets of cardboard together and cut out a small base larger enough to fit your putz house and its embellishments. 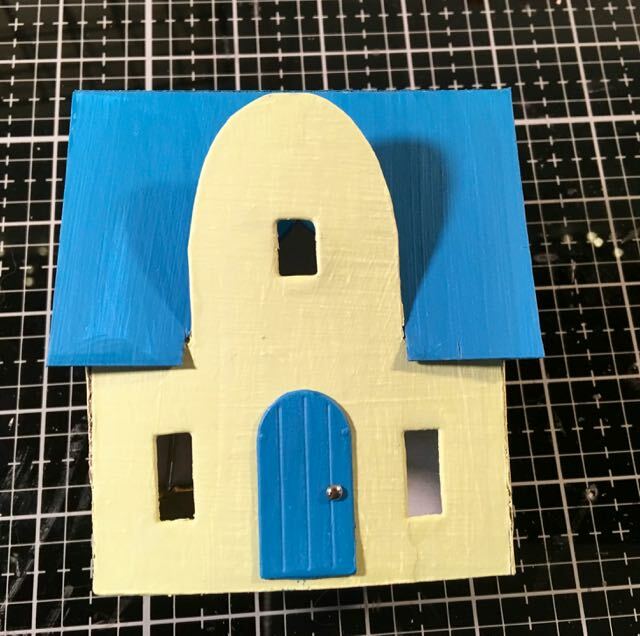 This house is 3 inches wide and the base is about 5 inches wide. 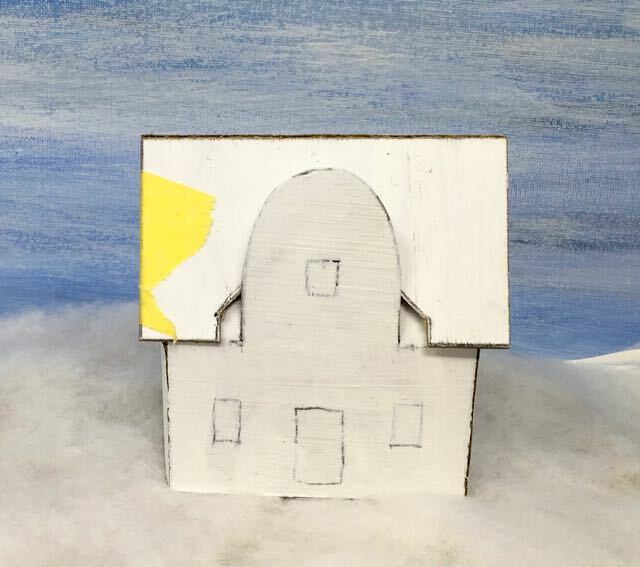 For these little houses, almost all the bases are white covered with snow. Here is the main reason I paint first before gluing the house together. I find it easier to glue on windows and the door before I’ve glued the house all together. I can place them better on the inside surface of the cardboard house when it is flat. To glue the house together I use a number of techniques – generally painter’s tape and binder clips to hold the house together. But sometimes there is no other option than holding a piece in place by hand to make sure the house glues together the right way. Reinforced front arch to add stability to the cardboard structure. It’s kind of messy on the back but you get the idea. Also in the photo above you can see that I glued a support piece on the back of the arch. I did that because it is a tall extension in the front and I don’t want it to flex when I glue the arch roof piece on. The pattern includes the optional support piece. 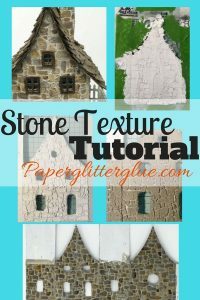 You may find this is a slightly challenging step in making any little house. You have to make sure the roof adheres to the body of the house in the correct alignment. Fortunately, PVA glues (the white craft glues) even including my favorite Aleene’s Fast Grab are forgiving. In other words, you have a few minutes to shift the cardboard pieces around to get everything lined up properly. The photos above show that I had some issues with the roof. First I made the pattern wrong. When I added a 1/4 inch overhang to the sides, I forgot that fact when I drew the first pattern. In the second photo you can see that the roof fits nicely. That is the correct one you that is on the published pattern. BUT after I painted everything, the roof didn’t fit quite as well. You can see that the left side of the roof sits higher than the right. I had to make a tiny cut on the cardboard to get it to sit correctly. You may find you have to trim the roof just a bit to fit. That is normal. The roof doesn’t quite fit on the left. A little trimming on the lower edge fixed it. Now comes the one challenging step to making this house. It’s just a matter of having your materials ready and being patient. To get the arch roof correctly aligned, you must first gently curve it with your fingers. 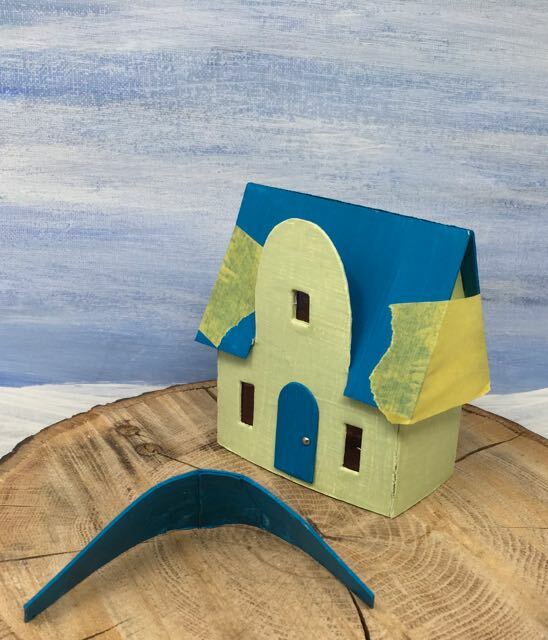 You do not have to score this roof, just make the cardboard bend to fit the arch. Test it while you are doing this. Don’t fold it, just curve it. Next tear off several strips of painter’s tape. I think you must have painter’s tape for this step or you will be holding the roof in place for 15-20 minutes. I also think it helps a lot to have a thicker glue like Aleene’s Fast Grab because it really does hold better. If you have a thinner glue, then apply the glue to both the roof and the edge of arch, wipe down so it won’t drip and WAIT. You can tell when the glue gets tacky – ready for gluing – when it loses its sheen. It gets just slightly dull rather than shiny. Finally place the roof in place. Apply the painter’s tape to the top of the arched roof first. You’re going to have to work a little to get the lower edges of the arch to adhere. I kind of make a tent with the tape over the lower edges. Check to make sure they are located where you want them to be. If so, let dry. Get a damp paper towel to mop up any glue leakage which is pretty much inevitable. Whew! Done with that step. Let dry. Now once your completed little house is ready, glue it to the base. I just run a thick bead of glue along the bottom of the house and place it on the base. Push it firmly in place. Don’t squash your house, just hold it firmly. After a couple of minutes it will adhere. Then let it dry. After all the construction and painting and gluing, you get to decorate. This is the most enjoyable step in making your little house. When I am doing a series like this, I don’t usually go overboard with the decorations partly because of time constraints. But really the little houses are plenty cute all on their own. 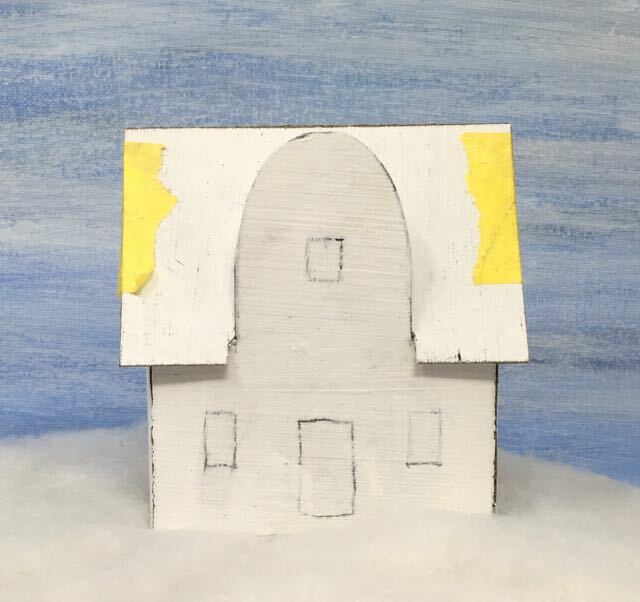 What I’ve been doing with these houses is adding a thick layer of snow – usually Snow-tex mixed with some white paint on the base and push it up against the house so I don’t smear too much on the sides of the house. Then I add a couple of bottle brush trees and usually a little Tim Holtz decorative deer. And that’s it for this little house. That’s the Christmas Putz house with the Round Arch in the front. I am so pleased with the colors – Bundled Sage and Mermaid Lagoon, Ranger Distress Paints. They go together so well. I was surprised. What’s next? I’m not sure what house I am going to make tonight. It will be a surprise for me as well. Let me know if I can help you with anything. Email me at Lucy@paperglitterglue.com or make a comment here. I will be glad to help. 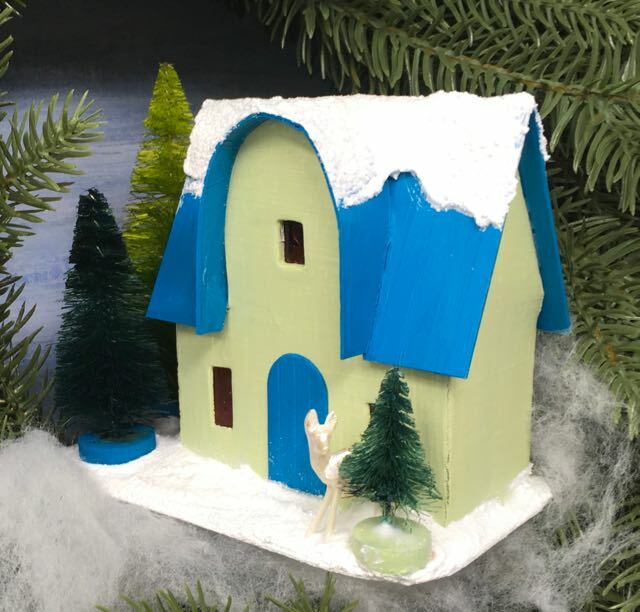 Make a little Christmas cardboard house with these easy instructions and the free pattern. 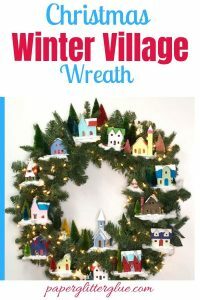 Add to your Christmas village. 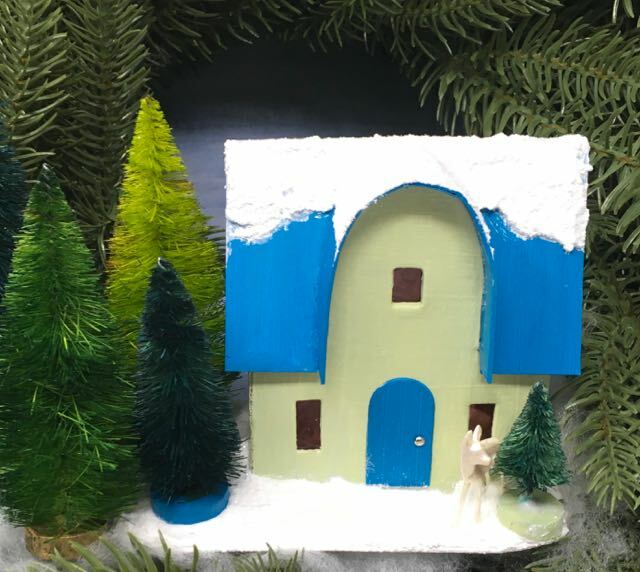 Want to make a fun little Christmas house to add to your Christmas village or place on your mantle or under your tree. Easy to follow instruction and free pattern.